William Shakespeare Jr.; antique fishing lure maker, born the son of a banker, had a myriad of interests as a younger man. 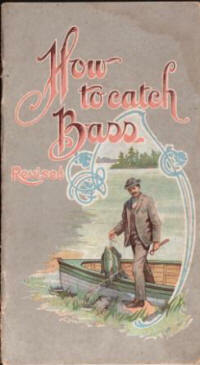 Most of which had nothing to do with fishing lures, rods or reels. I have a published book from 1898 with interest tables in it, which he and another author published. Might I add its very dry reading if your not into calculations for financial investments. What then lead him from finances to shutters, and eventually on to lures, we may never know. But, we do know is for the next 50+ years The William Shakespeare Company of Kalamazoo would directly effect us, the antique and old fishing lure collectors, as well as fishing enthusiasts throughout the world. His first patent was for the level wind reel, not for a old fishing lure. We shouldn't find it odd then, that through the next half century Shakespeare's reels appealed more to collectors and the public than his antique lures. William Shakespeare though inventing the level wind reel, truly gained his national recognition as a antique lure maker not only through his invention of the "Revolution" lure, but in my opinion jump started the company's lure breadth through its purchase and acquisition in 1905 of the Jay B. Rhodes company lure patents. In its lure beginnings the William Shakespeare Co. from Kalamazoo Michigan offered a few more antique lures than its rival James Heddon of Dowagiac Michigan. Shakespeare offered the following fishing lures shown in the 1903 catalog to the left: The Revolution, The Worden Buck Tail, The Evolution, and The Sure Lure. The William Shakespeare company thus too playing into a newly established frenzy in the fishing lure and tackle industry, fishing Artificial Baits of Lures. And, who could forget the fish which in the early 1900's indirectly caused so much controversy while building a few lure companies in its wake, The Black Bass. Shakespeare was concerned with the Art of Bait Casting, and I believe more concerned in the art and the whole ambiance of fishing as a sport and a hobby than any other old fishing lure maker including Heddon. As time progresses I will add to the Shakespeare pages, adding more history, to the evolution of some of their lures, from the mechanical frogs, to the underwater minnows and on to the kazoo. There will be pages on this website to help distinguish colors painted on Shakespeare lures, boxes and the numbers stamped on the ends. All in effort to provide a enjoyable education website devoted to the Old Fishing Lure.